Position-based trading for any state of the market. Higher timeframe chart is recommended as each trading setup requires some calculations based on the latest bar. Key number should be calculated first. It's based on the current price. For the quotes with 4 digits after a dot the key value is the current price multiplied by 10 and then rounded. For the quotes with 2 digits after a dot the key value is the current price divided by 10 and the rounded. Place pending Buy order at Current Price + (2 * Key value). Place pending Sell order at Current Price - (2 * Key value). Place stop-loss for pending Buy order at Open Price - (2 * Key value). Place stop-loss for pending Sell order at Open Price + (2 * Key value). Take-profit for both orders is calculated similarly to the key value but the current price should be multiplied by 100 for the quotes with 4 digits after a dot and shouldn't be divided for the quotes with 2 digits after a dot. In both cases the values should be rounded. Trailing stop is also applied to the orders and is set to 2.5 * Key value. Don't forget to cancel the untriggered orders after the timeframe period ends. If this sounds too complicated, see the example below. It's a EUR/USD H4 chart. The current price is 1.4810, the current bar's open price is 1.4832. There are 4 digits after a dot in the quotes for EUR/USD. That means that the Key value is calculated as 1.4810 * 10 = 14.8. Rounding it results in 15 pips. Pending Buy order level is calculated as 1.4810 + (2 * 15) = 1.4840. Pending Sell order level is calculated as 1.4810 - (2 * 15) = 1.4780. 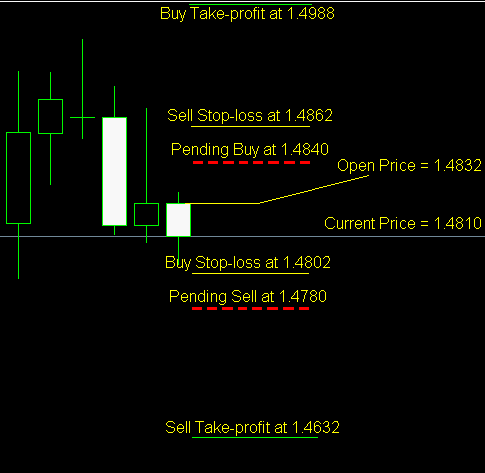 Stop-loss for pending Buy order is calculated as 1.4832 - (2 * 15) = 1.4802. Stop-loss for pending Sell order is calculated as 1.4832 + (2 * 15) = 1.4862. Take-profit for all pending orders is calculated as 1.4810 * 100 = 148.1 or, after rounding, 148 pips. Take-profit for pending Buy order is set to 1.4840 + 148 = 1.4988. Take-profit for pending Sell order is set to 1.4780 - 148 = 1.4632. Trailing stop for both orders is set to 2.5 * 15 = 37.5 or, after rounding, 38 pips. Forex strategy "Stochastic + EMAs' cross"